NEW YORK, NY, June 30, 2006 – James Nicholson Gallery is pleased to present its summer group exhibition “I may be some time…” The exhibition will open on July 6th and continue through August 4, 2006. In 1912, the members of the ill-fated Terra Nova expedition to the South Pole hit severe weather on their return journey. Trapped by the weather, they began to starve. One explorer, Lawrence Oates, believed that by leaving his team and sacrificing himself, he could save the lives of his companions. With extensive frostbite and an aggravated war wound, Oates left the safety of their tent saying, “I am just going outside and may be some time…” His body was never found. Despite his final sacrifice, the entire team perished in the expedition. Oates’ words mark the heroic gesture of one man’s last attempt to thwart nature’s omnipotence while submerging himself in it. Such power challenges, awes, persuades, and inspires each of the artists in I may be some time… These eight artists explore what happens when they push back against the forces of nature. While doing so, they simulate a human manipulation of their environments – accomplishing in art what we can never accomplish in reality – control over the indomitable. The results can be uncomfortable or entrancing, yet each reminds us of our human vulnerability in the face of nature as they depict our universal longing to be immersed in it. Constantly in motion, Christoph Schreiber’s untitled video piece renders once invincible mountains, now fluid. They flow with mesmerizing movement in a dance of the landscape designed and restricted by the artist. Summoning to mind the security of the Alps, the shifting of what was once immovable reflects the tenuousness of the natural world. As in much of his work, including the photograph Untitled 03_6, Schreiber takes a natural scene and subtly manipulates it to express the impact humans have on nature when we desire to control it, shape it, and be a part of it. Reto Boller has attracted international attention by altering his environment using starkly colorful paintings to invade the viewer’s space. In this exhibition he masterfully finesses textures, layers, and disorienting shapes to create an unexpected roughness that leads the eye around in an uncomfortable plot with no place to rest. Despite the work’s abstraction in image and meaning, the silver tape conjures shadows of snow and traces of the cold. Capturing a world between reality and fantasy, the floor sculpture Avalanche, by Fawn Krieger, suggests a scaled-down broken landscape as she seeks to locate domestic-sized slippages and interstices. Mundane objects are tilted, fractured, and layered, alluding to forgotten memories of place and touch. Giant landmasses shrink, shifting power to the viewer, and allowing the insurmountable to be accessed, engaged, and embodied. Disarmingly, Monika Goetz attracts and repels with her Convex / Concave mirrored wall sculpture – the work draws us in as just as it pushes us a way. The skewed reflection disconcertingly reminds viewers of their corporeal yet tenuous position in this space even as she alters the setting of her work. 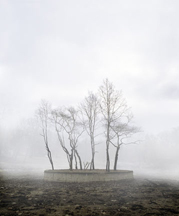 Silent and haunting, Fir Trees (Crater) and Ice Rink in Budapest, like much of Thomas Wrede’s photography, are inherently patient, subtle, and still. The winter scenes reproduced here unfold just as they were photographed and yet are somehow more perfect than transient nature could ever remain. A footprint in the Fir Trees (Crater) portrays the human need to be submerged in nature’s vastness. Sonja Braas’ photograph Forces #9 confronts nature at its most sublime and powerful and yet it is wilderness in a controlled form - a set meticulously crafted by the artist. Braas upends our assumptions and simultaneously jolts our sensibilities, but ultimately leaves us with a sense of a formidable environmental realism contained within a frame. Vibeke Jensen’s site-specific video installation brings the sounds and sites of the natural world inside the white gallery walls. Responding to her environment, she invites her viewers to cool off and relax, while challenging our relationship with the world. A world of elusive reality, Reindeer Journey is a uniquely intimate painting by Robert Stone. He places an almost magical creature in the darkness of a discordant surreal landscape and, as the figure turns, she beckons us to enter Stone’s illusive winter domain. This exhibition was curated by Lindsay Moroney.